Well, I had a fun run with this thing, but I just couldn’t quite keep up with it in the way I intended. 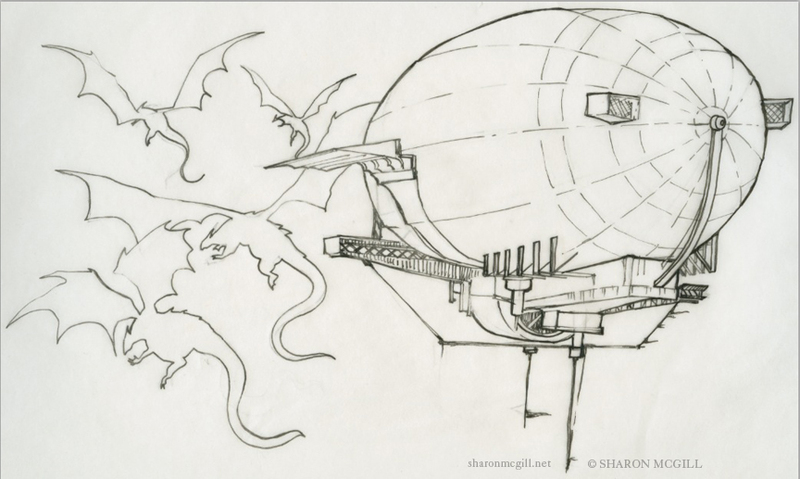 So this will be my last official post on this blog as I move over to a more consolidated project at sharonmcgill.net. Thank you so much for reading and commenting. Feel free to keep up with me on Twitter, Instagram, and at my newer (and likely much shorter) blog. Oh, boy. September already? 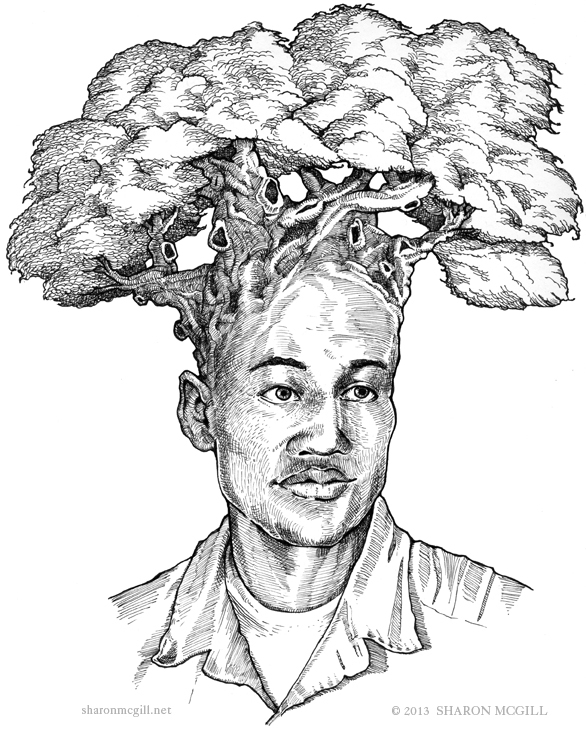 I guess it’s time for some drawings of people with trees on their heads. Actually, these are a few drawings for an upcoming issue of Monday Night I had to squeeze into Labor Day weekend and figured I’d share on my neglected blog. 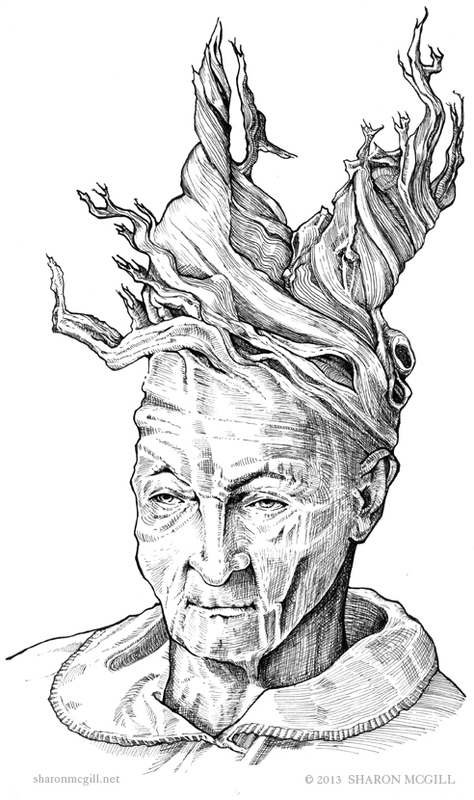 This one’s a bristlecone pine. These are some of my favorite trees in the world. 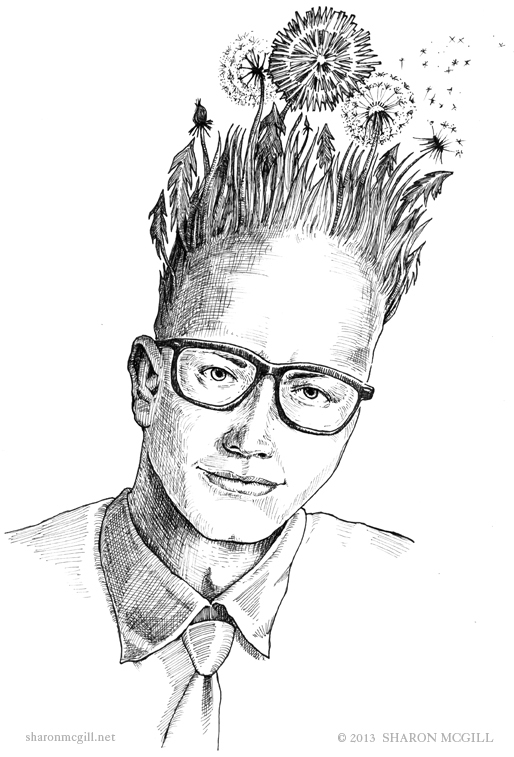 And here’s a hipster with dandelions. I was sort of tired at this point and in no mood to cross-hatch any more complicated roots. Not too crazy about how the grass and leaves turned out, but hey, it’s done. It seems I take this advice pretty seriously. I’ve been so consumed in my own writing that the blog has fallen off the priority list. 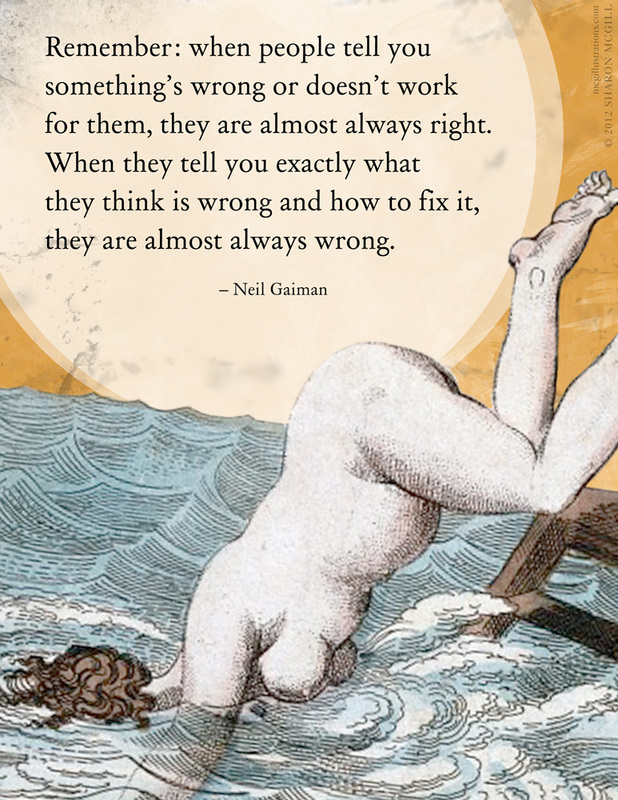 But these inspirational graphics seem to be making their way around the interwebs, so I’m hoping to get a few more up soon. Feel free to repost and share! All right, I’ve fallen off the blog again. I have some pretty good reasons, but they’re all the same boring ones: work, work, work. But! I’m halfway through this next major illustration project, so I can finally take a break for another behind-the-scenes post about process. This makes for a good follow-up to my last post as the drawing style followed a similar process for all the panels. For this project, I’m creating ten drawings for a somewhat magical-realist novel in which the main character takes photos on her phone. 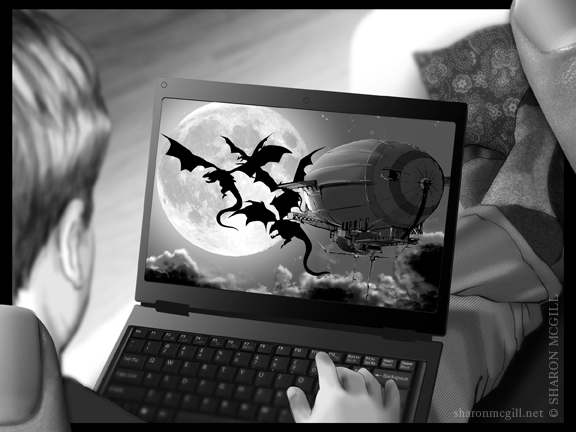 In this first image, the narrator sneaks a shot of her husband playing his favorite online fantasy game, which features flying dragons and a steampunk zeppelin. 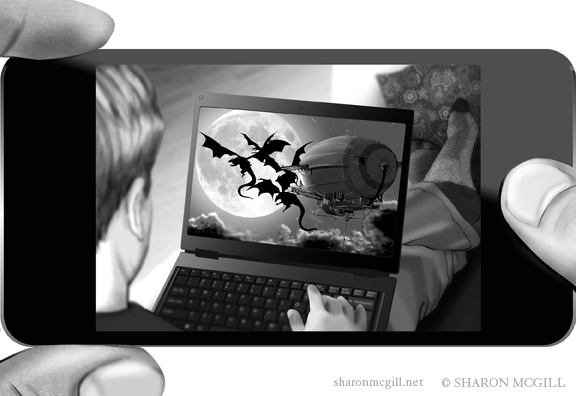 While I knew this would be a lot of work and require producing three images–the laptop screen inside the room scene, nested in the frame of the smartphone–I was secretly thrilled about the prospect of dragons. 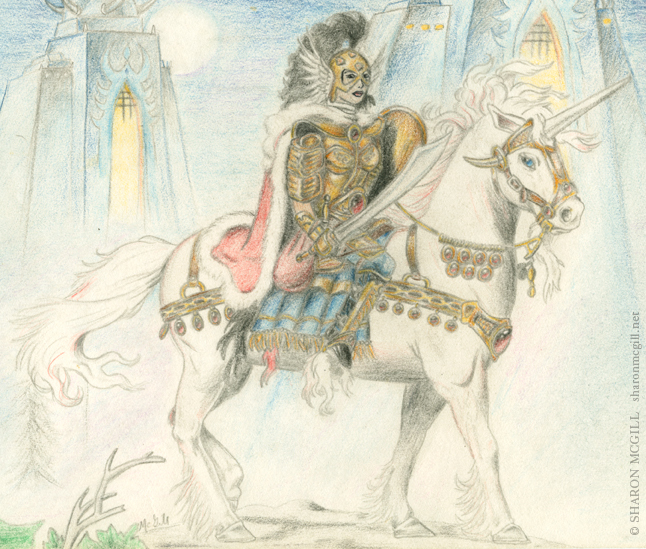 Once upon a time, I drew many dragons and unicorns. Yes, I was that kind of kid. 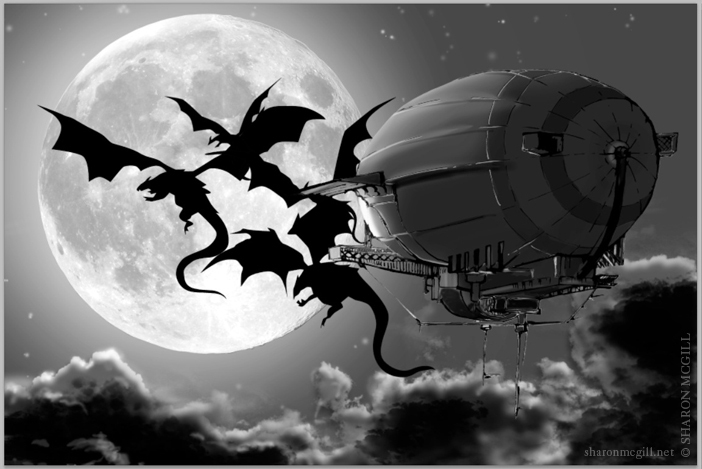 Anyway, it was fun to look up pictures of dragons and zeppelins and figure out how to assemble the thing. 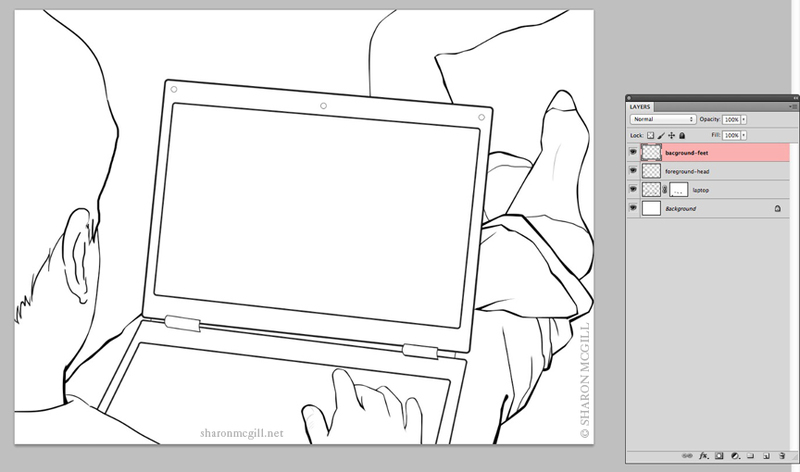 Naturally, I started off with the initial line work. 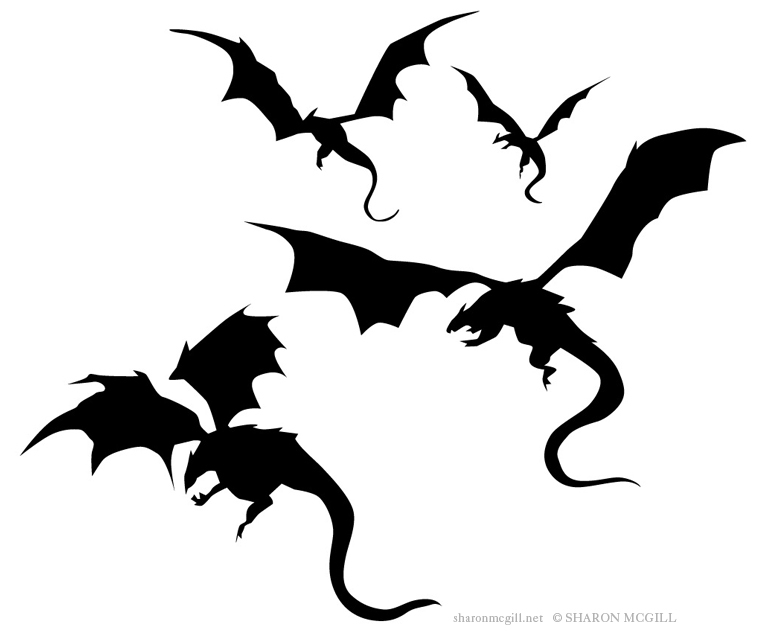 I brought the dragons into Illustrator as I knew I’d be moving and resizing them around a lot and wanted to work with vector images. Then I bring all this into Photoshop. The clouds were done with custom brushes. The moon is an actual photo of the moon with lighting effects. 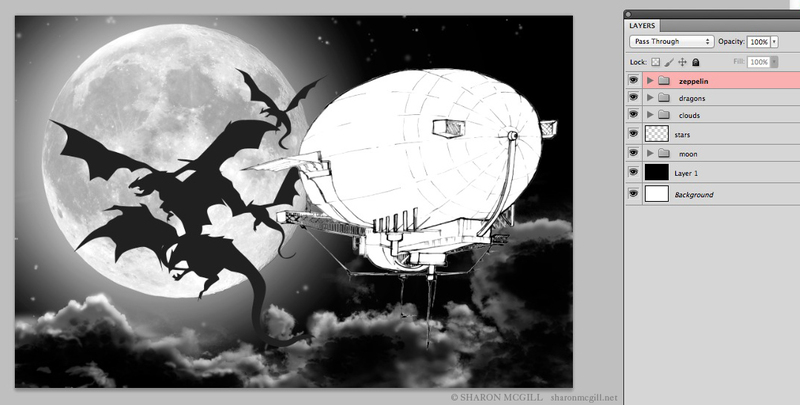 Then I spent another hour or so rendering the zeppelin. Once the screen image was done, I started the second drawing in pencil and ink. After a quick, clean-up in Illustrator, I brought the lines into Photoshop. Then I drop the screen shot in, render with other textures, and finally create an exterior of the phone to encapsulate the whole thing. The client, however, wanted the image to be bigger, so I zoomed in on the screen a bit more (top image). The fingers are off to the side so you still get a sense of what’s going on. And that’s it for Image #1. Only nine more to go! 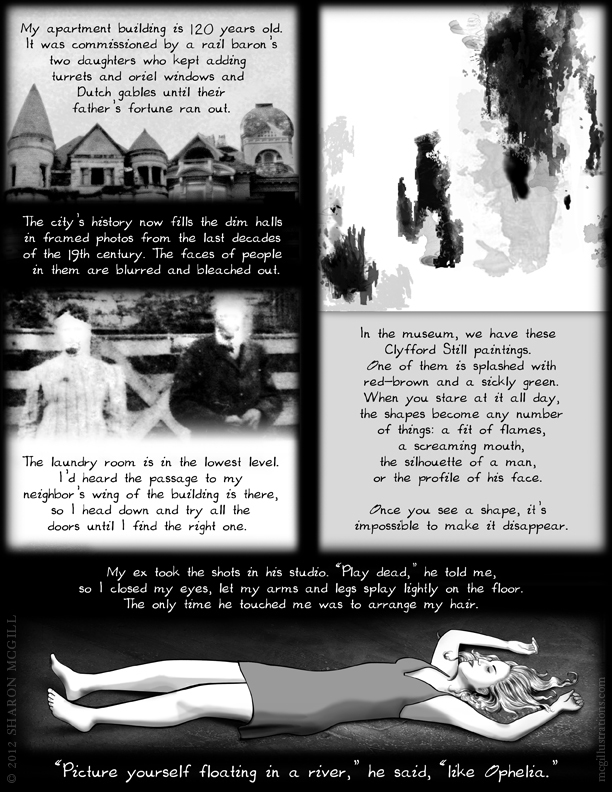 Recently, I had an idea for a comic/graphic story kind of thing when I remembered this odd piece I did over a year ago. 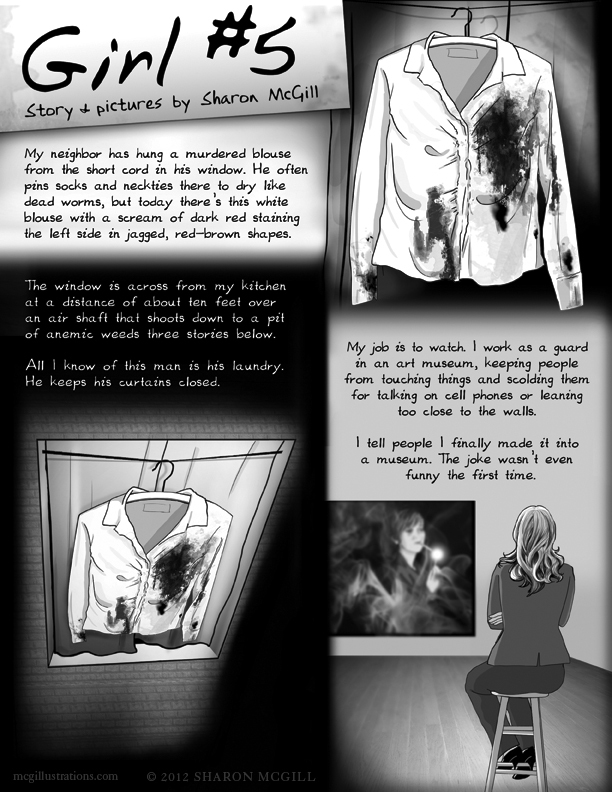 I submitted it to a few places, but it’s hard to find a publication that will take a super detailed, multi-page comic. Or maybe I was just too lazy to find one. Well, after a rejection or two, I figured the thing was too much trouble to deal with, so I filed it away and forgot about it. I’m basically a newbie with comics, though I enjoy the medium a lot. However, in terms of making them, they wreck havoc on my obsessive-compulsive/perfectionist tendencies. I find myself endlessly reorganizing the composition, agonizing over fonts, and reworking the story itself—which then requires more drawing and re-drawing. At the end of all that work, I’m stuck with this thing I don’t even know what to do with. Still, it’s kind of fun. I’ve created one other comic before this, but if I do ever complete a third, I’ll probably use a less labor-intensive visual style. Anyway, rather than let this thing continue collecting dust, I figured why not self-publish? So here it is. 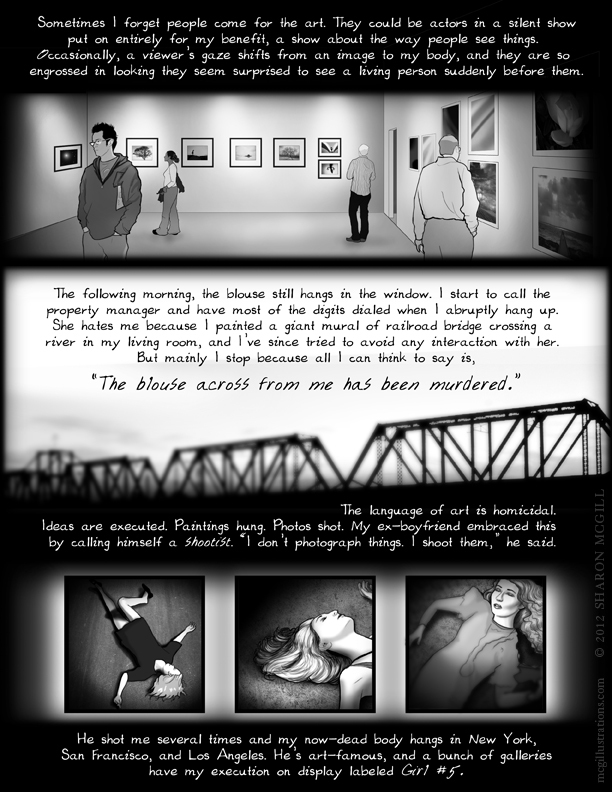 Click each image to expand to a larger size for reading. 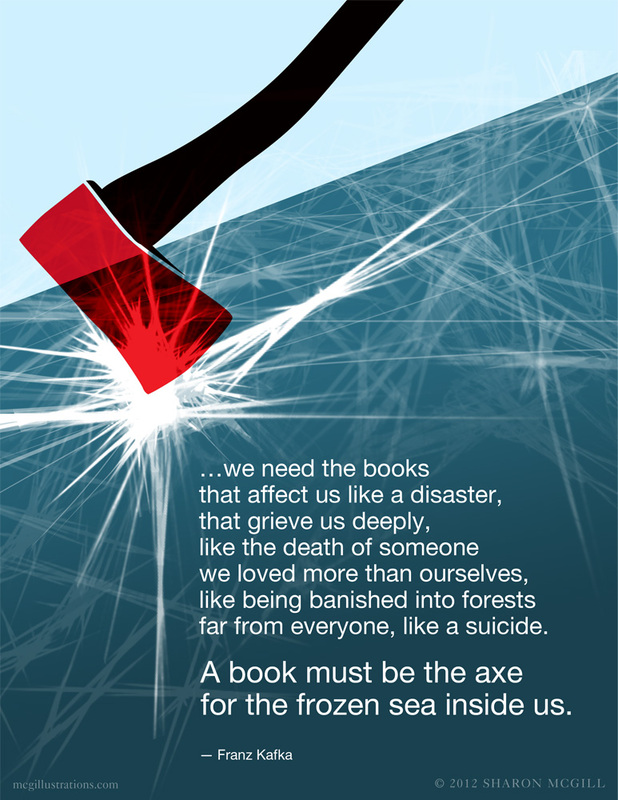 Given that I’m both a designer and a fiction writer, it’s no surprise that I absolutely love book cover design. And given my love of all things modern (yes, I adore that little black dress of fonts, Helvetica), it’s also no surprise that I have something of an obsession with vintage Penguin covers. If you’ve spent any time in used bookstores, you’ve probably seen them—old paperbacks featuring a simple title upon a clean Marber grid accompanied by a single striking photo or illustration. Source: Abduzeedo. The green was featured on crime titles throughout the 1960s. I’m not sure why I love them so much. If could be the simplicity, the boldness, the tease of that single-object cover (which is, incidentally, making a comeback thanks to one particularly popular book), or maybe it’s just that shameless Helvetica all over the place*. Whatever it is, I’m clearly not the only designer who digs it—just check out these gorgeous Harry Potter redesigns done in classic Penguin style. Squee! 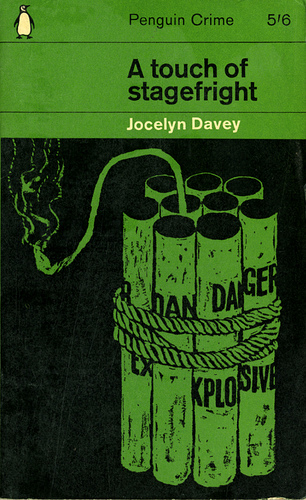 The design must take inspiration from classic Penguin book covers, using similar photo or illustration styles and fonts. Each one will be letter-sized. The design can only use copyright-free/public domain imagery or original art. 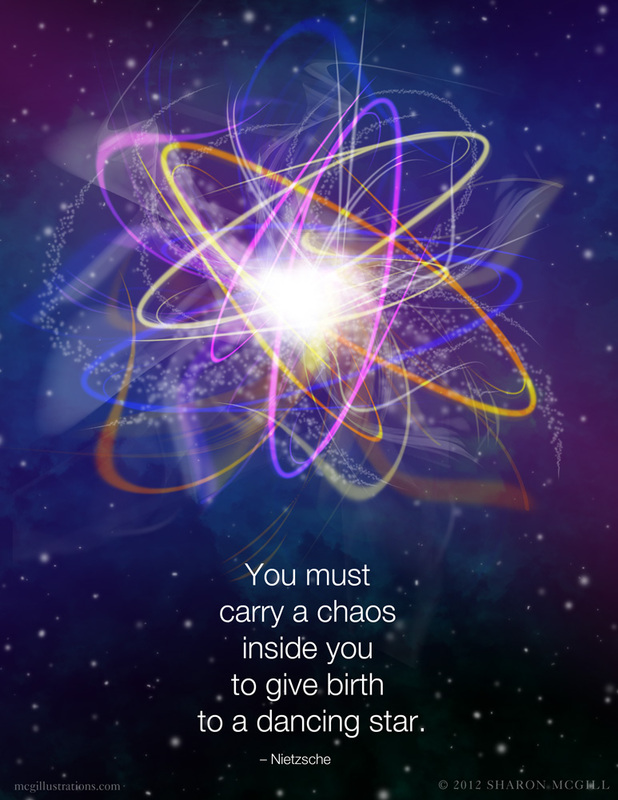 Each design must not take more than 1 hour to create. I kind of need parameters, probably due to the fact that I’m too used to working within brand guidelines. 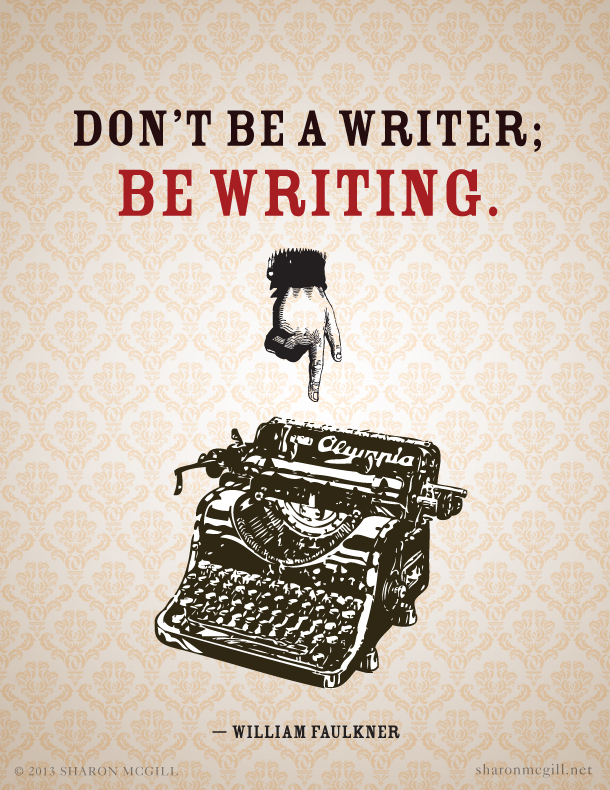 This is true even of my writing, where I often work best under some kind of time limit, word count, or self-imposed deadline. It’s a little disturbing to realize I’m obsessed with rules, but if they help me get the job done and prevent me from procrastinating because I don’t know where to begin, then who friggin’ cares? So instead of drawing, I have some of my favorite quotes to share. 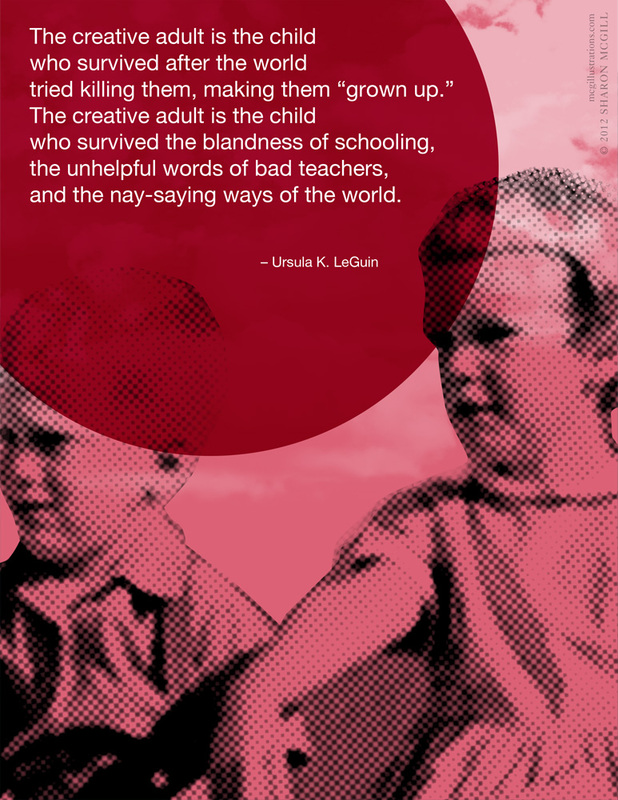 If you have any quotes about creativity you’d like to see turned into a design like these, feel free to post them in the comments. Maybe I’ll even throw in a free Facebook portrait for the one I find most inspiring! * I’ve thought long and hard about this Helvetica obsession. I’m convinced it relates to my love of patterns, grids, and uniformity, all of which stem back to growing up on U.S. military bases around the world. Helvetica was the primary font for signage on everything from the Commissary to the Shoppette, the bowling alley, the laundromat and just about anything AAFES. Funny to think how all those Cold War-era bases were fighting Communism while at the same time employing a distinctly socialist aesthetic. Frida with tennis ball and tongue. Oh, Photoshop, how do I love thee? Let me count the years. . .
Wow! Okay, so it’s been nearly two decades since I first started using my favorite software program. Back then, it was a wee 3.0, yet boasted these amazing things called layers (layers!) that any artist with a Macintosh Quadra and a love of all things flashy and new dove into and probably hasn’t resurfaced since. These days, of course, Photoshop is nothing less than a magical machine of infinite image-manipulation. It’s a powerful program capable of wonders (and disasters), and anyone who works with graphics these days should know at least enough about it to be dangerous. Unfortunately, the seductive power of Photoshop also makes us forget that to be truly dangerous, we need a firm understanding of the fundamentals of image-making. And that sometimes, the most amazing effects are done by hand. 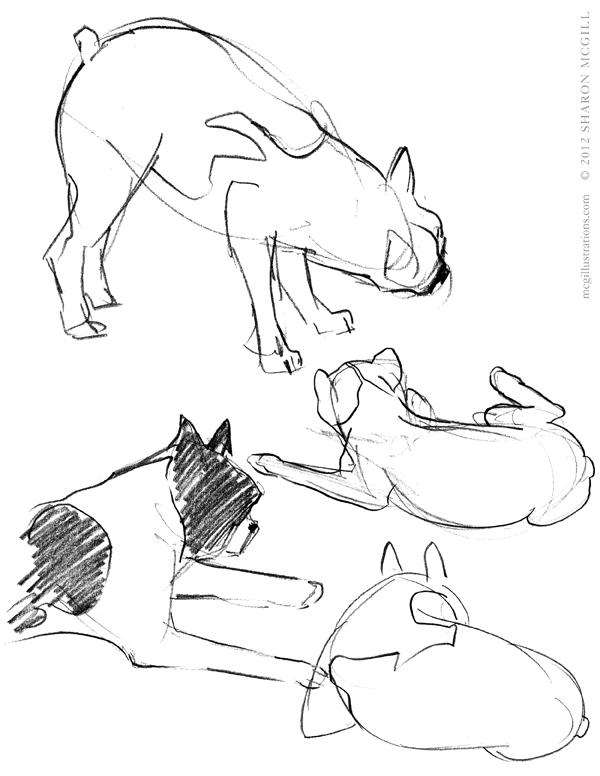 Frida will sit still for 3 seconds at most, which means these warm-up sketches are done faster than a Google search. Since I’d been spending far too much time on Photoshop lately, I took an afternoon to reacquaint myself with some old school wet and dry media. I had to see if I could still pull off some decent pictures without my digital magic wand. I recruited my loyal pup, Frida, as a model. 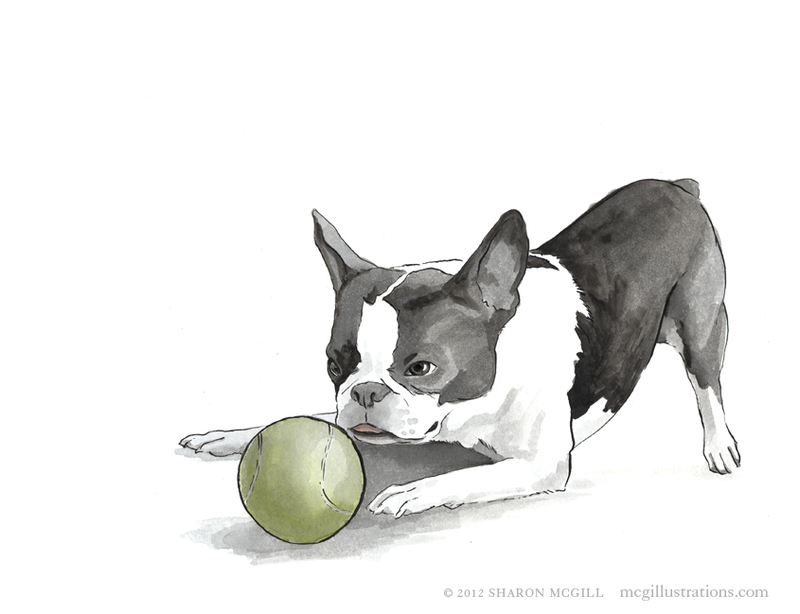 Being a Boston Terrier, she tends to move around a lot, and this offered the additional challenge of keeping up with her. I had to bust out the X-acto to sharpen the tip of my charcoal pencils. I was pleased to discover I could still whittle down a perfect point. 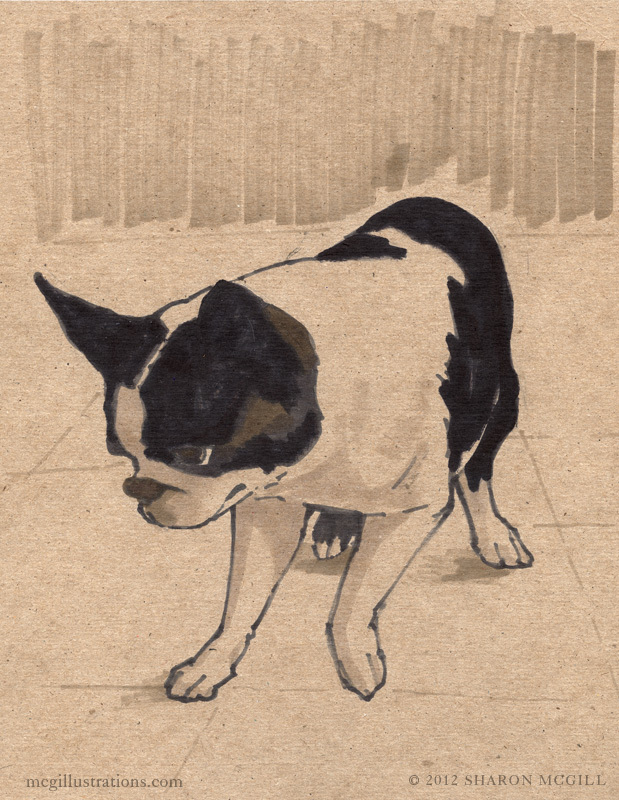 I had a bunch of chipboard and cardboard lying around, which I thought would make a nice alternative to paper. Then I dug up media I hadn’t used in a long time, including a small batch of Prismacolor markers. Does anyone still use these? I had forgotten how much I love those French grays! They still had that lovely smell of xylene in the morning—just another reason to work quickly. Prismacolor marker. Frida looks rather cat-like as she prepares to pounce on a tennis ball. 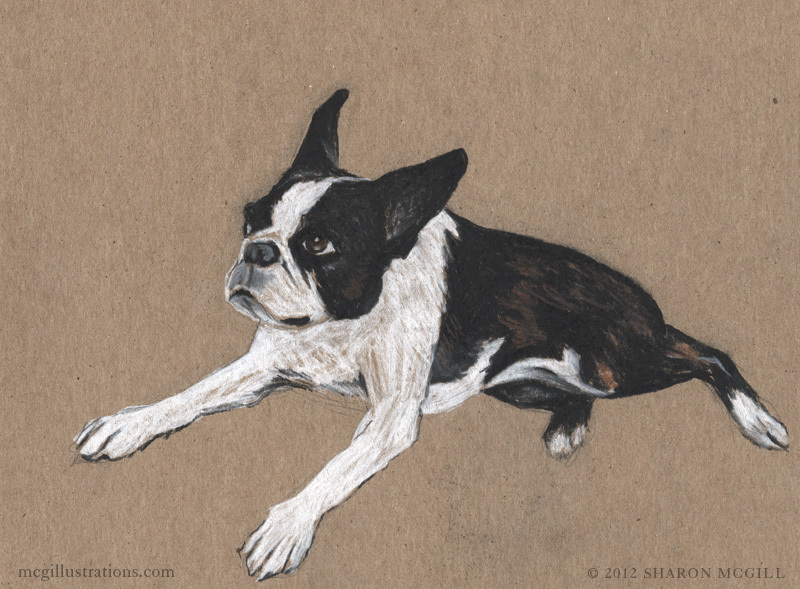 Okay, there’s nothing earth-shattering about dog drawings. However, it was a great exercise to get out the old tools and work without the benefit of lighting effects and infinite do-overs. But another thing I’d forgotten was the sensual joys of these materials: the dry scratch of charcoal and the gorgeous surprise of an ink wash saturating the page. Even the markers challenged me not only with their toxic stink, but with the knowledge that their line would not erase. When I made my mark, I had to mean it. Still knee-deep in a revision of my novel, I’ve been getting back to basics with that, too, and thinking about how fiction boils down to choice and consequence. After a decade of writing, I forget this sometimes as I’m dazzled by the whiz-bang shimmer of cleverness and postmodernism. By stories that are more special effects than especially affecting. As a reader, however, I find that such pieces won’t resonate with me unless I sense an emotional core somewhere, a reason for me to care beyond the spectacle. 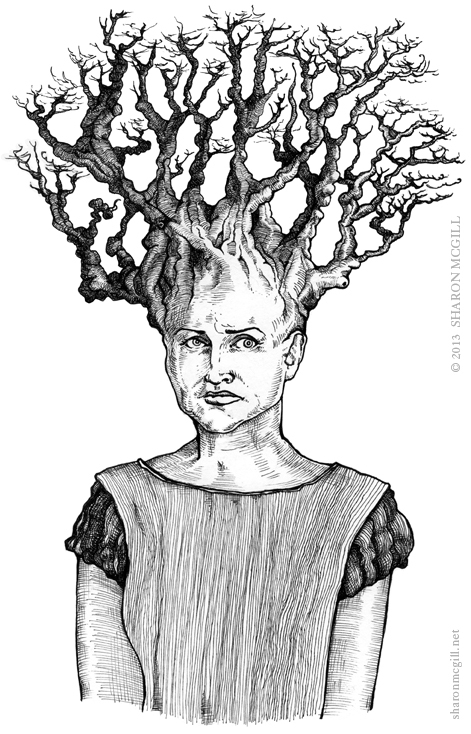 With my own work, I’ve been intoxicating myself with imaginative madness and forgotten that my characters have to make choices as well. That ultimately the shape of the book depends on mastery of the basics and a firm command of story—not simply clever illusions and allusions. At any rate, for my drawings, I’ll be stepping back from Photoshop a bit more. There’s something lovely about the fragility of a Crow Quill nib and the screechy sound it makes. So what if my gouache gets overworked and I draw outside the lines? It’s a reminder that my hand was there. 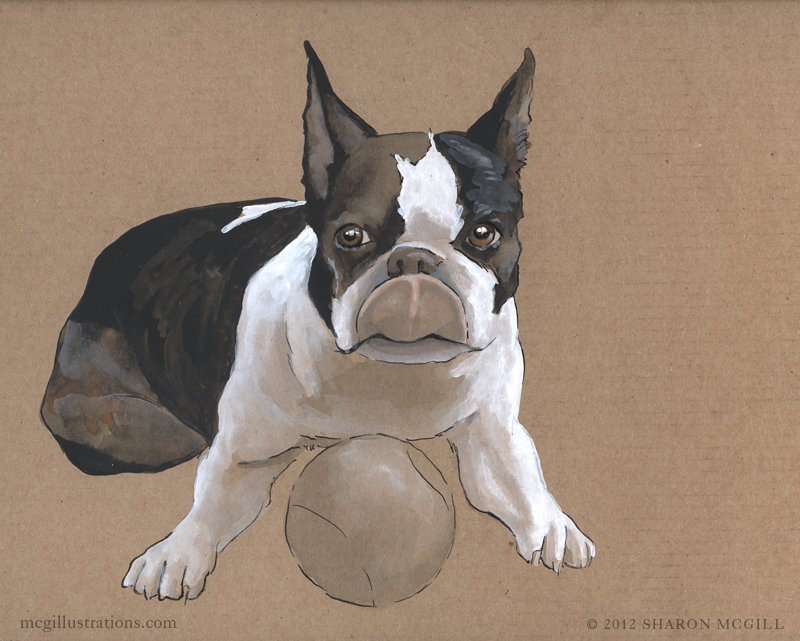 If solid composition and technique demonstrate that the artist knows her stuff, a few imperfections only make the piece more memorable. Couldn’t resist a touch of Photoshop color here. There’s really nothing wrong with digital tricks, so long as they’re used discreetly.